We continue our exploration of the Italian mountains by traveling to central and southern Italy, where we discover more notable mountain ranges in the midst of beautiful national parks (read Part One here). Besides the Alps, the other major mountain chain in Italy is the Apennines, extending from the Cadibona Pass in the northwest, close to the Maritime Alps, to as far as Reggio Calabria, at the tip of peninsular Italy, forming the country’s physical backbone in the shape of an arc. The Apennines extend for about 1,200 km (750 mi). The rivers, valleys and dense vegetation, inhabited by a rich fauna, create wild landscapes of great beauty. 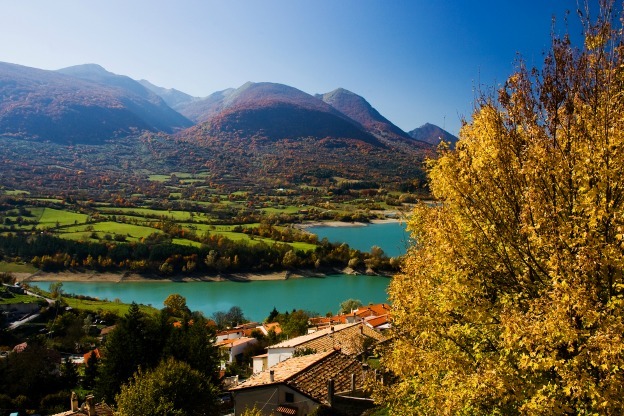 Here’s a selection of parks within the Apennines mountain range where you can admire such beauty. Straddling the border between Emilia-Romagna and Tuscany, in the Tuscan-Romagnolo Apennines, the Foreste Casentinesi, Monte Falterona and Campigna National Park is one of three national parks in Tuscany and protects scenic stretches of forests and woodlands of the Apennines. A rich variety of wildlife inhabits the park, with as many as 100 bird species. Monte Falterona, which, at 1,654 meters, is one of the park’s highest peaks, is where the river Arno, the one that passes through Florence, springs. 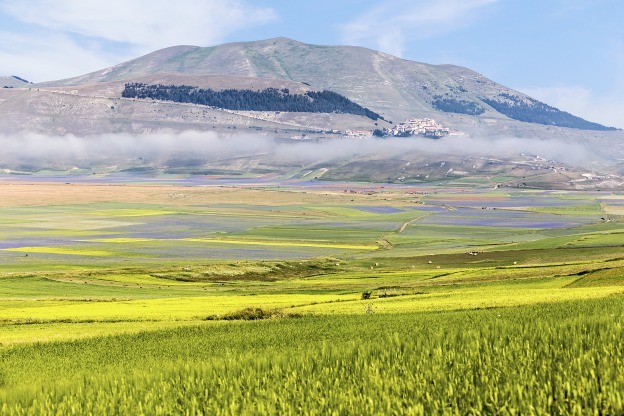 The Sibillini Mountains, in the central Apennines between eastern Umbria and the Marche, are part of the Parco Nazionale dei Monti Sibillini, a beauty both in winter, with the mountains dusted with snow, and in summer, with an explosion of colorful poppies and cornflowers. Established in 1993, the 70,000-hectare park is home to a fascinating landscape of glacier-carved valleys, hilltop hamlets, beech forests, and mountains, mainly composed of limestone rocks, which formed in the Mesozoic and Cenozoic, meaning 100 to 50 million years ago, on the bottom of an extinct sea. Most of the peaks reach heights above 2,000 m (6,600 ft); the highest is Monte Vettore at 2,476 m (8,123 ft). Some of the wildlife inhabiting the park are the wolf, the golden eagle, the peregrine falcon and the roe deer. A comprehensive network of trails offers adventure, and perhaps an encounter with wildlife, to the outdoor lover. When you get hungry, stop at one of the many huts offering hearty meals of the local tradition. 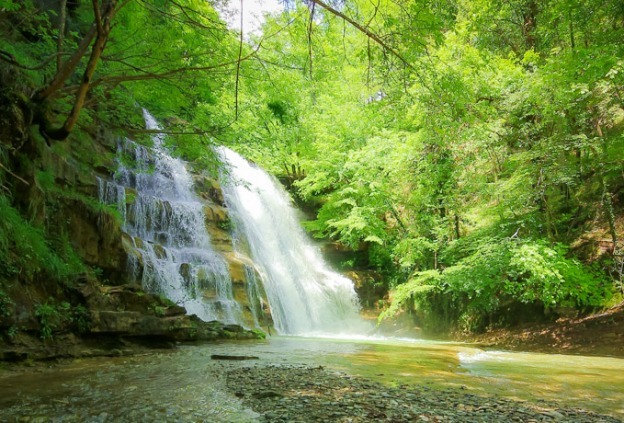 Don’t miss the Gola dell'Infernaccio, Monti Sibillini's most beautiful waterfall. Sasso Tetto is the main ski area in Monti Sibillini. In the heart of the central Apennines, covering 50,000 hectares among the regions of Abruzzo, Lazio and Molise, is the Parco Nazionale d’Abruzzo, established in 1923 to preserve and safeguard some unique natural features and wild animals. Mountains, streams and rivers make it an ideal destination to spend pleasant days in close contact with nature, to admire uncontaminated landscapes, and a varied flora and fauna. Some species such as the Marsicano brown bear (a critically endangered subspecies of the brown bear found only here), the golden eagle, the Apennine wolf, and then deers, otters and chamois, call the park home. Nearby is the Parco Nazionale della Majella, Abruzzo’s most diverse park, with 500 kilimeters of paths, giant beech woods, ancient hermitages and a number of ski areas. The Apennines’ second-highest peak is here, Monte Amaro (“bitter mount”) at 2,793 meters high. Encompassing part of the southern regions of Basilicata and Calabria, the Pollino National Park, with its 1,820 square kilometers, is the largest natural park in Italy. 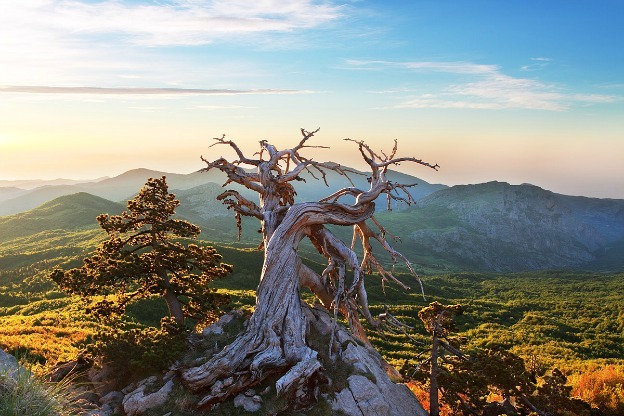 It takes its name from the Pollino Massif, whose highest peak reaches 2,267 m. Founded in 1992, it includes both natural and archaeological points of interest and is the richest repository of flora and fauna in the south of Italy. The park has a varied landscape, from deep river canyons to alpine meadows, to mountains often covered with snow in the winter, and forests of oak, maple, pine and fir. The park's symbol is the Bosnian pine (pino loricato), which right here has its last remaining growing area in Italy. The park is home to a varied wildlife as well, including roe deer, wild cats, wolves, birds of prey, and the endangered otters, Lutra lutra. The park's most spectacular areas are Monte Pollino (2248m), Monti di Orsomarso (1987m) and the canyon of the Gole del Raganello. Have you visited any of these national parks?